Though this is already old news it has to be documented before the next one comes out! Izzy was the last of his friends to finally lose a tooth. It happened December 14th, after days of anticipation. For what seemed like weeks on end, he wiggled and jiggled it with his tongue, showing off its looseness to all who could stomach it. His Papa couldn't bear the sight of the tooth and would run off in horror, whereas I was reminded of the enjoyable days of my own tooth wiggling. 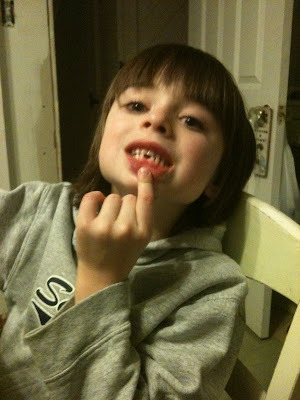 It was only after a Chinese dinner with D. the dentist (his new pal) that the tooth began to hang by a thread. The following morning, a crust of toast did the trick and the tooth landed on Izzy's breakfast plate. That night, the Tooth Fairy came with two dollars but Izzy insisted he knew it was me. No fooling him.